We're not a regular bakery; we specialize in gourmet cupcakes and homemade ice cream. Each day our team is hard at work preparing the sweetest treats, using only the finest ingredients. We serve 13 signature cupcake flavors everyday, and surprise with two or three additional special flavors daily, giving you 15-16 exciting flavors to choose from on any given day. 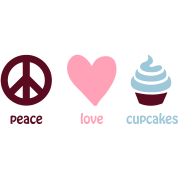 In all, we have over 230 cupcake flavors. Our ice cream is made fresh, in house daily, in small batches with over 90 flavors available. The creamy texture, bold taste, and exciting flavors will not disappoint. You can expect to find 8-11 ice cream flavors available on any given day we're open. We're confident these are the best cupcakes, and the finest ice cream, available in the Fayetteville Metropolitan Area. Stop by the store and say, Hi. Make Smallcakes your favorite desert and sweet treats location - after dinner out, on the way to or from a movie, after school treat, or just because you or someone you know deserves it. We look forward to serving you. Don't settle for previously frozen or day old cupcakes and other treats - visit Smallcakes for the freshest and best tasting cupcakes and ice cream in the area. Follow us on Facebook and Instagram for up to date news, information, and fun. Thank you for being a customer of Smallcakes. We appreciate the support you provide to our local business.